Janet Murray designed serious games and digital humanities projects at MIT in the 1980s and 1990s where she also taught the world’s first course in interactive narrative design. Since 1999 she has been a Professor in the Graduate Program in Digital Media at Georgia Tech, where she currently also serves as Associate Dean for Research in the Ivan Allen College of Liberal Arts. 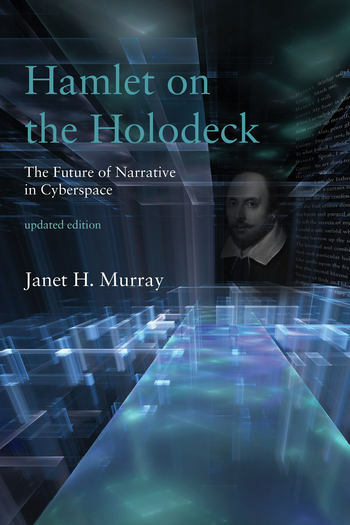 When Hamlet on the Holodeck came out in 1997 it became the catalyst for a foundational debate in Game Studies, the tension between stories and games as distinct genres of human expression. I have never changed my own position on this controversy. I believe that games and stories are both forms of representation (neither one is more “real” than the other) and that they have shared many structural elements from ancient times onward as they continue to do in emerging digital forms. I reviewed the controversy again for the new edition of Hamlet on the Holodeck, updated and reissued from MIT Press this year, noting how the self-described “ludologists” had come to accept narrative strategies as legitimate parts of game design, and how many players had responded enthusiastically to new interactive narrative formats. But the controversy continues to flare up with surprising energy from time to time, as we have seen in the past few weeks, raising the question of why some critics should continue to find the mixing of narrative and games deeply disturbing. This excerpt from my update to Chapter 5 “Agency” offers my more recent thoughts on the source of this anxiety and of the related cultural panic we saw in GamerGate, both of which can be understood by recent research into how gambling machines create a particular state of psychological arousal and dissociation. In Addiction by Design (Schüll 2012), Natasha Schüll describes the desire of players at gambling machines to enter “the zone,” a state more pleasurable than winning, because of its comforting dissociation from the emotions and demands of the real world. The “zone” is the place in which agency and immersion can become maladaptive, where the disconnect from the real world approaches the kind of pathological dissociation in which people forget to eat or to remember that the money they are spending is needed for the responsibilities of life. I have personally never been intensely captivated by Tetris, but I have played similarly “addictive” abstract games (like Threes) in this obsessive, mindless mode, held by the continual feedback of rapidly responsive events and tantalizing near misses in fairly short gameplay, all of which has been understood by psychologists for some time (Loftus and Loftus 1983). Gambling machines refine the zone-inducing effects of so-called “addictive” casual games to enhance profit. We turn to Solitaire or Candy Crush for a milder version of the gambler’s obsessive state, without the danger of catastrophic financial loss, but often at the risk of wrist injury and considerable wasted time. It strikes me that being in the zone while playing a symbolic video game full of pleasurable reinforcement and near misses that entice you to try again is the opposite of being a protagonist in a story—it is about losing one’s sense of self in the experience of the present moment, divorced from past and future. The zone might even be thought of as a welcome obliteration of narrative itself, a release from the anxiety of being within our personal stories. Looking at it this way suggests another source for the peculiarly vehement animosity expressed toward my analysis of Tetris (and the lack of a similar response to Aarseth’s parallel edge case of playing Lara Croft as a chess piece). Playing open-ended, strategic, but largely unwinnable games like Tetris is indeed an expression of the anxieties of contemporary life, as I argue in this chapter, but it is also a remedy for these anxieties which works by inducing the experience of a perpetual now, a zone of dissociation from our common mortal story line in which choices have consequences and there are no do-overs. Calling the player’s attention to the cultural context of abstract game play and to our deeply rooted narratizing of experience, then, is a threat to the fragile boundaries of the zone. The comfortingly empty, deliciously manipulable symbols of abstract games offer us a relief from the narratizing mind, sheltering us in a timeless present, putting us in the zone, somewhere on the spectrum between a gentle sense of remission from everyday anxieties (say, a few habitual Sudoku puzzles at bedtime), and a desperate dependence on the rituals of pattern-making (the gambler who ignores his winnings to keep in rhythm with the patterns on the screen). When we ask enthralled players to step back and notice the cultural context of play, we are breaking a very precious spell; it is not surprising then that they resist the effort to see their enrapturing abstract symbols as meaningful signifiers linked to the common web of meaning, and their own actions, whether inside or outside the zone, within our existentially anxious human consciousness of individual choice and inescapable time. Previous Article← Judge Not, Lest Ye Be Judged?